ANYONE HAVING INFORMATION ABOUT THE NEWCOMB BUSINESS, WE WOULD LIKE TO HEAR FROM YOU. USE THE CONTACT US LINK. 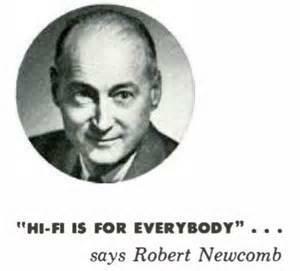 In 1937, Robert D. Newcomb founded Newcomb Audio Products in California. 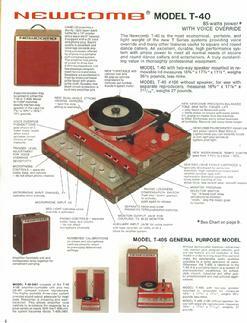 The company designed, built and distributed record transcription players, including many other audio reproduction devices. Robert D. Newcomb died at the age of 90 on March 24, 2010 in Davis, California after a brief illness. He was born on February 12, 1920 in Vallejo, California. This is a current photo of the once Newcomb factory in Sylmar, CA. The facility is now owned by another company. Use Google Maps to see more of the property. Site of the 1950's Newcomb factory. (6824 Lexington, Hollywood 38 Ca.) The company relocated to Sylmar after a fire at this location. If you're looking for Newcomb information, you'll probably find it here. There are NO web sites built, offering this much information, all in one place. If it's not here, send a question and maybe we will have the information you need. 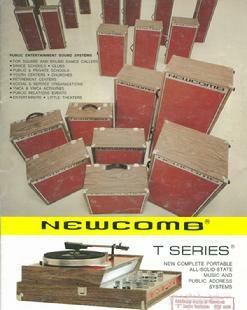 Parts for Newcomb phonographs DO NOT exist. There was NEVER any NOS parts on the market. When Newcomb closed its Sylmar plant, everything went away. 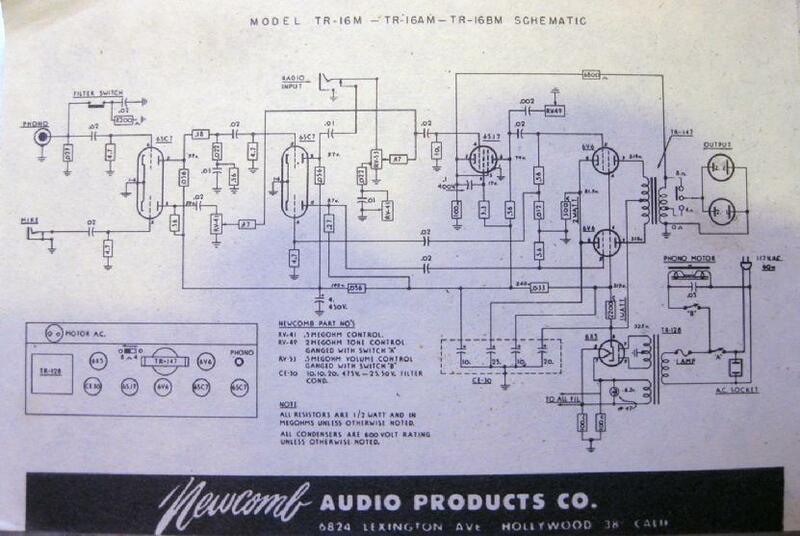 In addition, Newcomb did not release schematics for their phonographs. You will find a tube chart and possibly a schematic, glued inside the case. All tubes are easily obtained on Ebay. 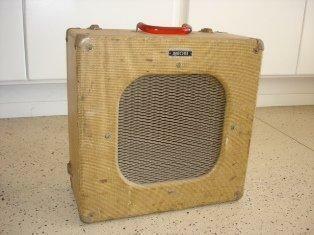 Many with an interest in guitars have found Newcomb amps to suit their needs. This is most likely due to the pure audio quality. Below, you will see images of various Newcomb Transcription players, from the first model, to the last. 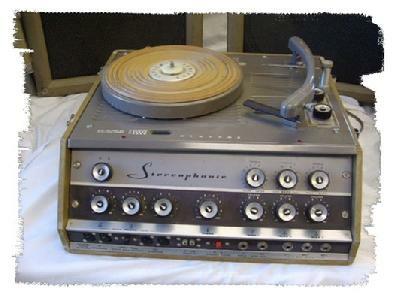 Until the latest model, these player would accomodate records with a diameter of 16". 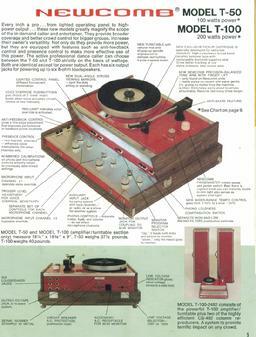 "Transcription" gives reference to a specific size record; 16 inch. 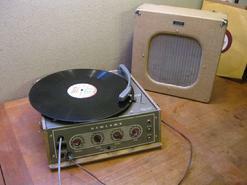 In this year, Columbia release the 33 RPM LP. 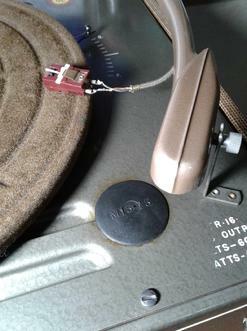 The transcription player above is the only unit with a rubber plug, acting as a buffer for the stylus. 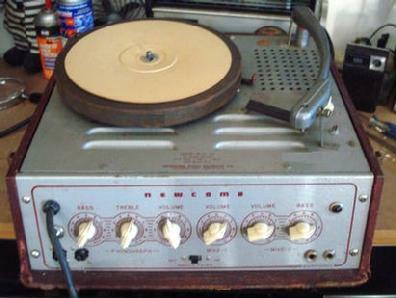 This is before the tone arm rest was created. 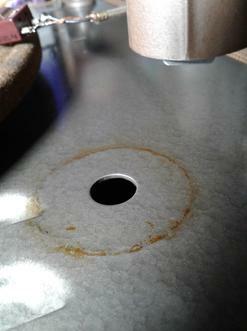 Not that dropping the stylus on this rubber disc would prevent damage, but it's better than the steel chassis. This model contained a two speed transmission and a mechanical brake for tempo control. 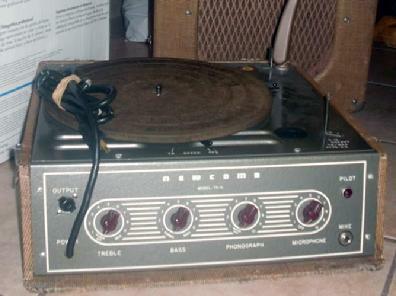 Notice the additon of a new tone arm drop and a radio input and an AC accessory plug. 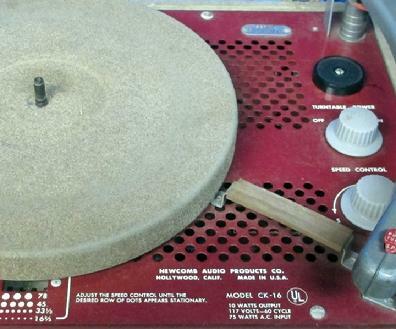 Tone arm is now gray, not tan. Possibly, BM stands for basic model? 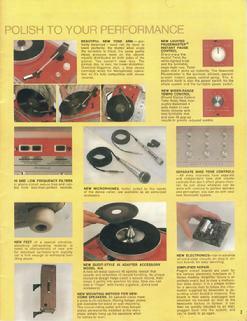 This platter and motor will be used in the R series classroom record players. 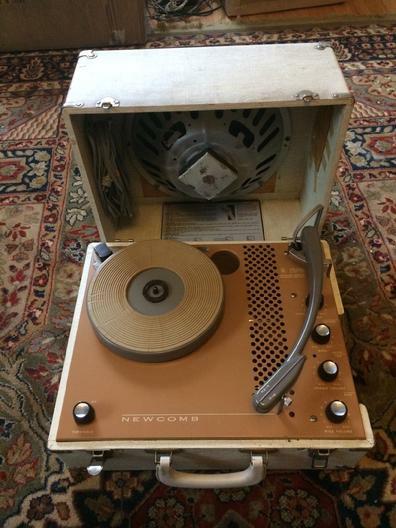 a wire wound speed control, spring loaded feet, push/turn GE cartridge, tone arm rest, 45 adaptor, scratch filter, strobe and tone arm weight adjust. 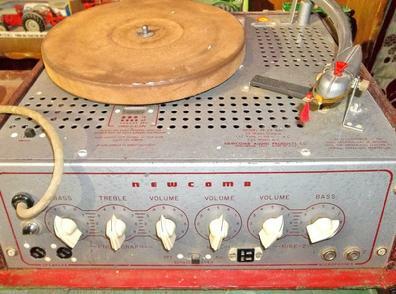 The next version, with the same model number, had a gray case, red deck, gray platter and round knobs, to replace the chicken head knobs. 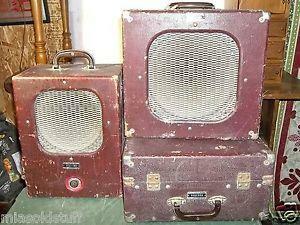 Same large size case as the model above. The model below is down sized and has some new switching features. Both units performed exactly the same, EXCELLENT! Here are two variations of the same model. The successor had a gray case with a red deck. There are two screw base incondescent bulbs under the platter to light the strobe disc. They are wired in series. If one burns out, the other shuts off as well. Replacement bulbs can be purchased new from http://www.tubesandmore.com/search/node/lamp for $3 per box of ten. Check voltage before ordering. Note: The newer series players use a neon bulb. Yet another variation of the TR-25 model. 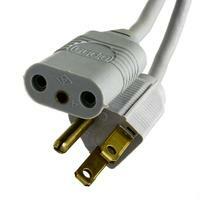 This unit is equipped with a four conductor Cinch Jones plug for connecting a monitor speaker. This was a great square dance unit. While music could be heard from the monitor, announcing was heard only through the main floor speakers to prevent feedback. A volume control is located on the front of the monitor unit and is a line level connection. This unit is rarely seen. 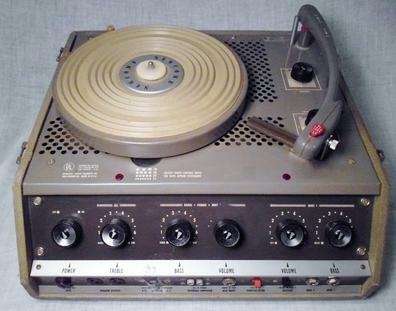 This TR-25 has a floating deck. 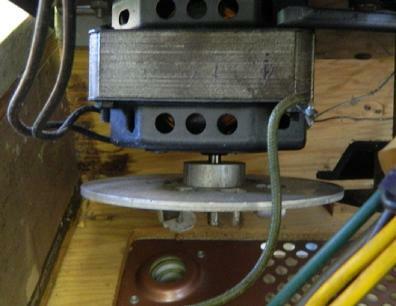 Instead of having four spring loaded feet underneath the cabinet, The motor and platter rest on springs. Springs provide two functions. 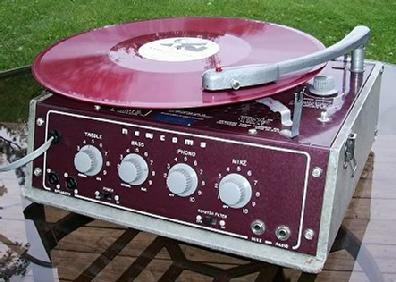 First, they isolate unwanted vibration from entering the tone arm and second, they reduce the possibility of the stylus losing tracking due to an unintentional bump to the cabinet. 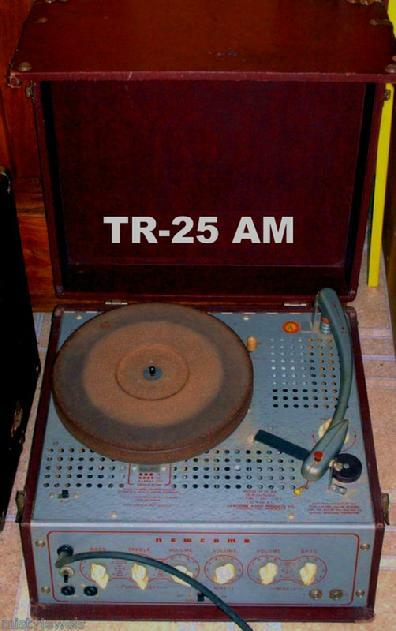 This is a newer version of the TR-25 AM, but with many upgrades and changes. This model has a red deck and grey case, including the new magnetic speed control. This is a 25 watt unit. Model CK-16 is an upgrade for the TR-16AM shown above. The upgrade provides four speeds, on/off switch and a mechanical tempo control. 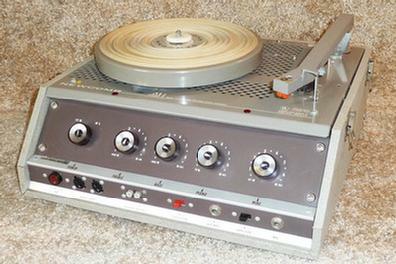 The original deck had only three speeds, on/off switch included with the speed selector and a reostat speed control. 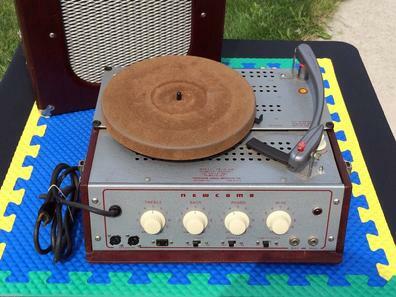 The only real addition was the 16 rpm speed. 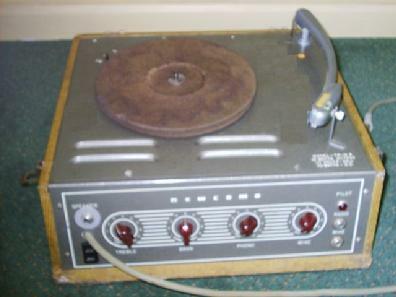 The original tone arm was transferred to the new deck. ED-1610 - Quite a stripped down model. No variable speed control, no strobe, but has a tub amplifier. 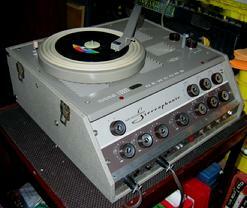 Will accept a 16 inch transcription record and has a microphone input. 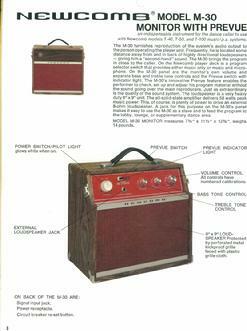 The model number = 16, maximum record size and 10, amplifier output in watts. 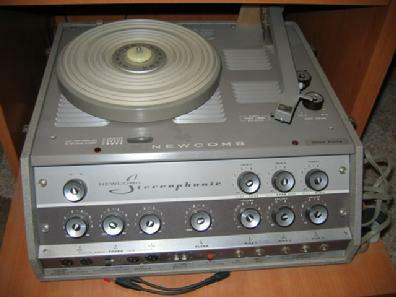 Newcomb used a variation of this tone arm on all their older transcription playes. Variations included tan, or gray. Some had a hole in the top for the GE VRII push/turn cartridge. 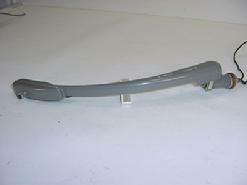 Some styles also had a red adjustable weight adjust lever. 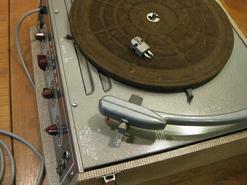 Those without the adjust lever could be adjusted by moving a metal tab attached to a spring, located underneath the tone arm toward the back. 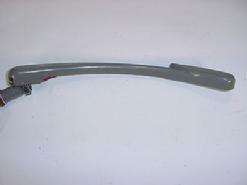 This tone arm is curved, opposed to the newer square design. TR denotes transcription, 16 indicates record size and 25 determnes wattage. 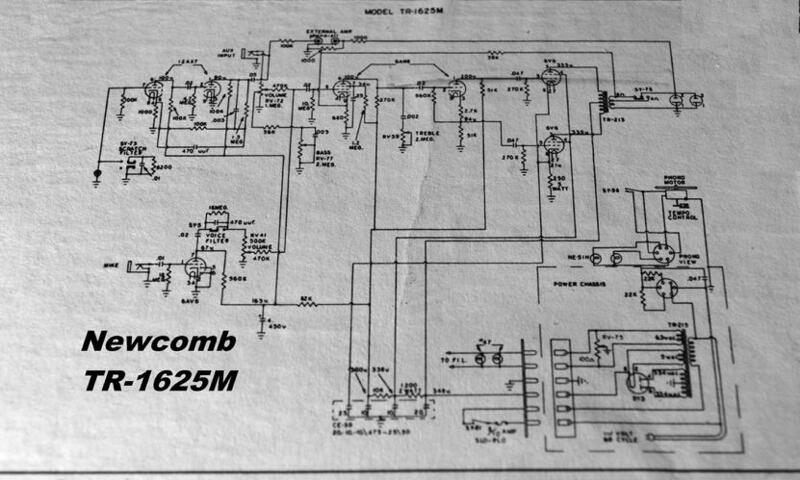 Here is a rare look at the TR-1625M schematic. Has many similar features as other TR-16XX models, with many extras. 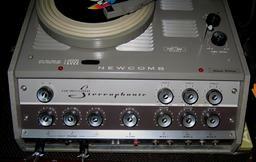 The baby of the transcription players. 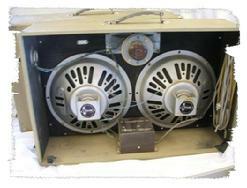 Continues to handle 16 inch records, but has a much smaller tube amplifier. Sound quality is not as rich as the big brother models. Model R-16. Left - Later Model. Right - Earlier Model. shown above and is STEREO. 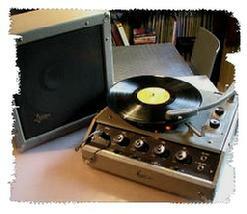 but with a smaller amplifier. Note: The original Astatic 13t cartridge was recently replaced with a new P-226, ordered from the link below. 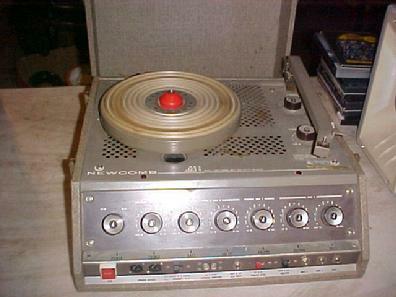 This transcription player never sounded as good as it does now. For the cost of a NOS 13t, you can buy new and get audio you will appreciate. 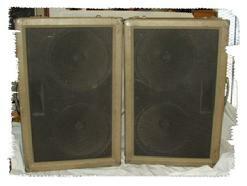 Optional speakers for the TRS-1680. Four of these can be used at the same time. The audio level is incredible. The TRS-1680 was produced, using two styles of tone arms. 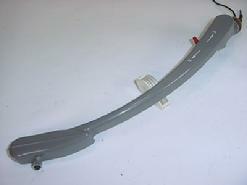 The earlier player came with the curved arm and the newest model came with the straight arm. Both are Astatic. Possibly my imagination, but the curved arm appears to have better tonal quality. What was Newcomb thinking??? 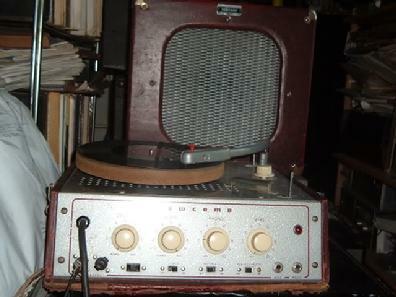 The "T" series record players have several TZ-11A transistors in the amplifier. These transistors were made in Poland and are extremely rare, if they even exist. It doesn't even show up in the cross reference catalog during the years of production. If your "T" series amp loses this transistor, there is newly discovered hope. The cross reference for the TZ-11 and TZ-11A is NTE 123AP. After testing, this substitute works quite well. 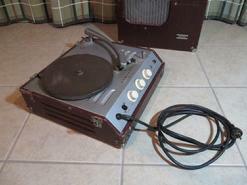 The question has come up several times about the AC power cable for the T Series record players; what is it and where do I get one? The cable is an Alpha 544. 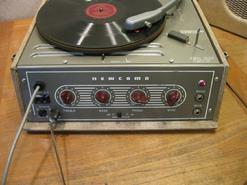 It was once used in HP test equipment as well as this Newcomb. Update: This item is now out of stock. 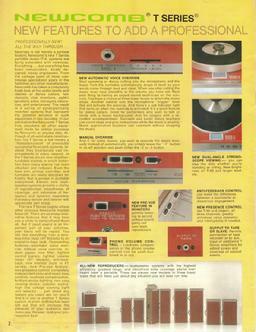 Selected pages from a Newcomb sales catalog have been selected for your viewing, which includes the T series record players. If you would like this brochure in PDF format, here it is for FREE. Enjoy!